This page summarizes all of the merchants available in Skyrim. For those added by the Dragonborn add-on, see this page. The Master Trader perk increases nearly all merchants' gold by 1000. The merchants who have more gold are all identified in the notes of the following tables. The Investor perk allows you to invest 500 gold in certain merchants, after which that merchant will permanently have 500 more gold available. Some merchants are bugged -- they have the dialogue allowing you to pay them 500 gold, but doing so does not result in any permanent change in the merchant's available gold. These merchants are not checked in the "Invest" column in the following tables, but instead the bug is noted on the individual merchant page. Investing in a merchant improves that merchant's disposition towards you, which can count towards becoming a Thane in the relevant Hold, if you are on the appropriate quest to help members of that hold. Fences are Thieves Guild fences, and are only available to people who have joined the guild. Each fence has a particular quest that must be completed to make the fence available. Fences originally only have 1000 merchant gold, but that can be increased to 1500, 2250, 3000, and then ultimately 4000 gold by upgrading the guild. Fences are the only merchants who will normally purchase stolen goods (unless the Fence perk is unlocked). General Goods traders will buy any items, and sell a variety of items. Spell vendors buy and sell magic-related merchandise: spell books, Soul Gems, mage apparel, and the like. Additionally, they will buy jewelry, clothing (but not armor), and staves, regardless of whether or not they are enchanted. If the Merchant perk is unlocked, all merchants will purchase all types of items. The perk also makes some additional items available for purchase. All vendors will sell you items from their personal inventory, possibly including food, lockpicks, and gems. They will also sell you any bugged items that are in their merchant chests. Most notably, apothecary merchants will sell a dozen ingredients that normally they are unable to sell. 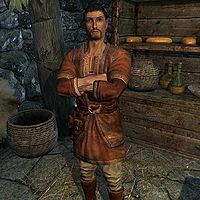 Note that outside of Hunters, Peddlers, and Skooma Dealers, merchants rely on merchant chests for their merchandise, and the chest contains whatever Leveled_Lists it was assigned; this is the primary reason Investor and Master Trader only sometimes work, because both rely on the relevant chest containing Perk-based gold. Hence, while the merchant types listed here can be generally relied upon to determine what a merchant will buy from you, they should be regarded as guidelines, not rules, for what the merchant will sell you - for example, this is why the Skyforge chest contains unique items for sale no other merchant sells, even though it is listed as a "Blacksmith" below. Whenever two merchants are listed together in the following tables, it means that the two merchants share the same merchant chest. Therefore, the merchants will always provide the exact same list of items, and share the same merchant gold. If one of the people is listed in parentheses, that person only takes over the store if the first person dies. If you are married then your spouse will open a store, whose merchant chest is located inside the home where your spouse lives. If your spouse is on the list below, then he or she will continue to sell the same type of items. Otherwise, your spouse will become a general goods trader. †It is possible to invest endlessly with Angeline. She never loses the dialogue option to invest, but her permanent base gold cannot increase, due to a bug. †Ghorza gra-Bagol will have the dialogue option to invest in her store, but the only option is to decline, due to a bug. However, the option works just fine with Tacitus Sallustius. Investing in either one (after having fixed the bug mentioned above) also invests 500 gold in Moth gro-Bagol, due to another bug. Both bugs are fixed by the current version of the Unofficial Skyrim Legendary Edition Patch. Atub and Garakh at Largashbur were apparently intended to be merchants (apothecary and blacksmith respectively), but do not function as one due to a bug. Anoriath will allow you to invest in his store, but his available gold will not increase due to a bug. Adrianne Avenicci is unique in having access to two merchant chests; when she is outside during the day, she sells items from a separate chest. When she is inside and the store is open, she uses the same chest as Ulfberth War-Bear. The two chests are counted as separate stores for the purpose of investing. * Hunters will not dissipate their wealth when you sell them things. They have theoretically unlimited wealth. It is just that they will only pay up to a certain amount of gold for a single item, or a single stack of items. Merchants who are also Trainers add the gold that you pay them for training to the gold they carry in their personal inventory. As such, it then becomes available to be used for bartering as all personal items not equipped can be purchased from a merchant. Resetting the Speech perk tree using the Black Book Waking DreamsDB does not affect investments that you may have previously made with merchants. If you move your spouse to one of the homesteads added by the Hearthfire add-on, they will often wander around outside the house where their merchant chest will not be available. To engage in trade with your spouse, wait until they go inside, or if they are a follower you can ask them to follow you and lead them inside. Loading a savegame after trading does not restore a merchant's gold or inventory. For example, if you initiate trading with a merchant who has 750 gold, sell things to them until they only have 20 gold left, then load a saved game, the merchant's gold will still be at 20. Any items you bought before reloading will also be gone from the merchant's inventory. In a related bug, if you completely exit the game and restart, you don't have to wait 48 hours for a merchant to reset. Another way to cause a trader to reset prematurely is to save your game, attack them until they become hostile, and then reload the save. Rarely, when you sell items to a merchant, you do not receive any gold, only Speech experience. This glitch is more likely to trigger if you buy a lot of items from the merchant before selling your goods, mostly from the apparel tab. This occurs when the vendor's gold goes above 32767 which is above the 2-byte limit. This page was last modified on 25 May 2018, at 19:39.